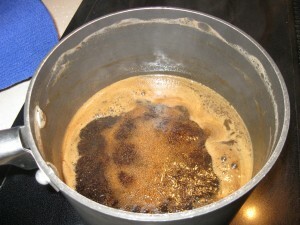 I began by boiling down a bottle of Black Butte Porter, for about 10 minutes. 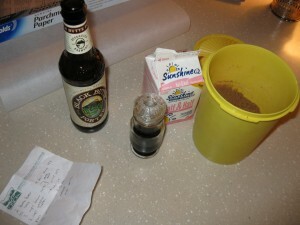 Then added 1 1/2 cups of brown sugar. I let that boil for an unknown amount of time before adding 1/2 cup of half & half, a dash of corn syrup, and a pinch of vanilla. Now, it is at this point that I feel I made a crucial mistake. Without a candy thermometer, I was unaware when my mixture reached it’s perfect temp. Thus, I believe my creation burned. 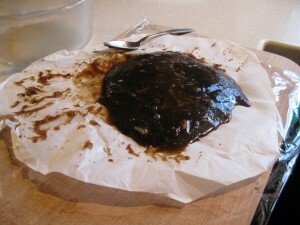 When the stuff’s consistency was adequate, it was poured into a wax paper lined bowl, and shoved in the fridge. The next day it was not the prettiest of sights, but was edible. I then attempted to roll it in plastic wrap and freeze it, but so far that was another mistake. I’m not quite ready to declare the whole thing a complete failure, I haven’t used it as an ice cream topping yet. In hindsight, I believe my goal all along should have been Beer flavored toffee, much like Werther’s Originals. One thing I do know, the greats never quit and give up on their dreams. Did Betty Crocker give up when she burned her first bunt cake? Did Chef Boyardee give up when his first batch of soccer ball shaped pasta looked like basketballs? Not a chance. 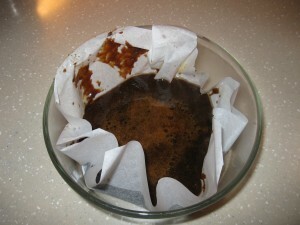 So am I going to hang up my apron, just because I ruined one little batch of caramel? …. Probably.